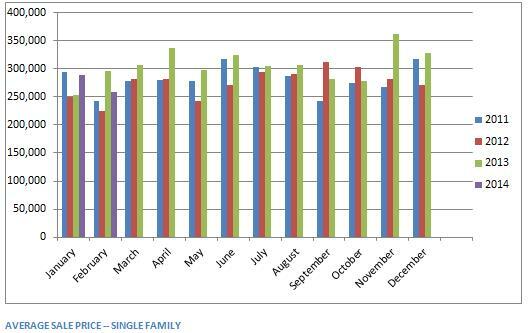 Let's see how single-family home sales fared in February. The number of homes that sold (32) is down from last month (43) and February of last year. We've been hearing quite a bit lately that inventory is low, so this may be a reflection of that. The harsh winter probably hasn't helped much, either. Some other less-than-stellar news is the average sale price in February ($259,593) was down from January ($288,906) and again February of last year. And the average days on market stayed the same as January (43). We're still in the tight grip of Winter, hoping spring temperatures will find their way to Wisconsin soon. Inventory levels are low so for anyone thinking about selling, this is a great time to get your house on the market. Less competition means more buyers looking at your well-priced house. Check back in a few weeks to see how things look for the first quarter of 2014.